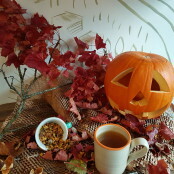 This Hallowe'en inspired brew is bound to be one of your new favourite teas!! 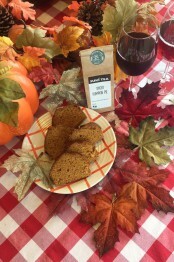 An autumnal blend that celebrates the best flavour of the season, the comforting, smooth sweetness of spiced pumpkin pie, another guilt free treat, all the flavour none of the calories. An autumnal blend that celebrates the best flavour of the season, the comforting, smooth sweetness of spiced pumpkin pie evokes all the nostalgic feels! This herbal tea is another quilt free treat, offering up all the flavour with none of the calories - yes please! Apple bits, Rosehip peels, Ginger, Grapes, Cinnamon, Pumpkin bits 4.8%, coriander seeds, flavour, cloves, cardamom fruit, turmeric powder, pepper, cardamom husk, sunflower petals. Good morning ,I love the tea I tried so far but I cannot buy all the time it is a treat.I bought some for friends.All the staff are very helpful thank you .Jean Sadza. Service rating : High quality teas with fast shipping. The mint chocolate chai is especially well balanced and quickly became one of our favourites! Product : I like it, but it tastes more like the spices that go into a pumpkin pie rather than a pie itself. Still a very nice comforting tea. I have bought tea from Suki teahouse Ltd before and will do again. The tea is so special and full of flavour. I use the loose tea and its crammed full of fruit, spices or what ever flavour you buy. Buy with confidence. Service rating : Fantastic teas, fast delivery and much nicer than any herbal teas ive tried before. Product : Warm, flavoursome and homely. Service rating : Really great service from this company discount on multiple items. Fast shipping, just wish more of these teas were available in store. As having to either order loads to get free pnp then there is a storage issue. Or pay postage on small amounts. Product : Amazing... wasn't sure... Service rating : Really great service from this company discount on multiple items. Fast shipping, just wish more of these teas were available in store. As having to either order loads to get free pnp then there is a storage issue. Or pay postage on small amounts.